Nov Sat 3rd Bellingen, #5 Church St, NSW 7.15-9pm $20 Tickets at the venue. Her single, Leaving Town is the third track from the My Queen album and has a fantastic video to accompany it. Click on the video link below to check it out at The Music website, or you can also watch it at hellothematic.com. The Leaving Town Single is OUT NOW on All Digital Platforms via MGM and features 3 intimate Acoustic Bonus Tracks “Better Girl”, “Into Your Heart”, “Leaving The Country” recorded earlier this year live in the studio for an Aussie Music Weekly Radio Special. The Single is also available on CD as part of the current My Queen Full Length CD LP available at all good music stores. After the success of their Single/ Video release “A List As Long As Your Arm” on the 5 of June. There are only good things coming to this Sydney based band, playing their music around the less salubrious parts of Sydney town. 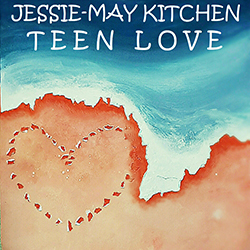 They also have a radio interview lined up with Aussie Music Weekly playing on the air at the end of August. About; Did you ever make a wish that only brought you trouble? Well then here are the band for you because they know that feeling well. Did you tell a secret and find out everyone already knows? Then let The Vegas Nerves talk you down because they understand. Their work has been compared to a consultation with a psychiatrist who could well be crazier than you are. They can’t make too many promises but if you come out of your safe spaces you could learn something new. You might remember how to celebrate both the sublime and the ridiculous in the everyday and avoid listening to bores who are afraid and offended by their own shadows. The Vegas Nerves are a four-piece band boasting the Latin beats of Alejo Alvarez, the rhythmic bass of Cameron McWilliams, the steadfast guitar of Jürgen Joader and the solid words and voice of Stephen Greenacre. Playing their music around the less salubrious parts of Sydney town. Did you ever make a wish that only brought you trouble? Did you tell a secret and find out everyone already knows? Well then The Vegas Nerves are the band for you because they know that feeling well. They can’t make too many promises but if you come out of your safe spaces you could learn something new. You might remember how to celebrate both the sublime and the ridiculous in the everyday and avoid listening to bores who are afraid and offended by their own shadows. The Vegas Nerves are releasing their debut album An Act Of Faith in August and are looking forward to getting as many people as humanly possible to hear it. Some fools may confuse telling the truth with pessimism, others know that only honesty can really set you free. Q. Tell us about the moment you decided to become a singer/writer/band? What did your family/friends have to say about it? A. I can’t remember ever not wanting to do this but wouldn’t dream of telling my family or friends. Q.Who are your early influences? A.Cole Porter and Jilted John. Q.What is the first record you bought and why? A.”So” by Peter Gabriel. Why? Because I’m an idiot. Q.What current/new Artists/Bands inspire you and why? A.DMAs, Jen Cloher, Just A Number, John Grant, The Arctic Monkeys, Royal Blood. Q.Tell us a little about your writing process, how does a song come along? What gets you going creatively? A.I’m always writing in my head which makes travelling by public transport a problem as I’m always getting off in the wrong places. I fall in love about 16 times a day which is good for the creative juices but nothing else. 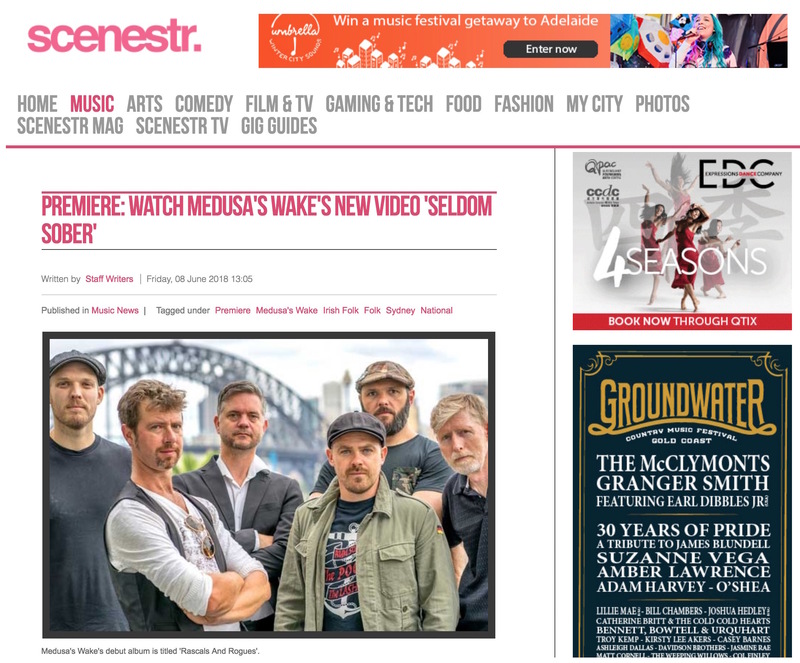 With the recent release (1 June) of Sydney Celtic Folk Rockers Medusa’s Wake’s debut album ‘Rascals & Rogues’ with a very uptempo and energetic style of music that will have you raising your beer glasses and showing off your skills on the dance floor. 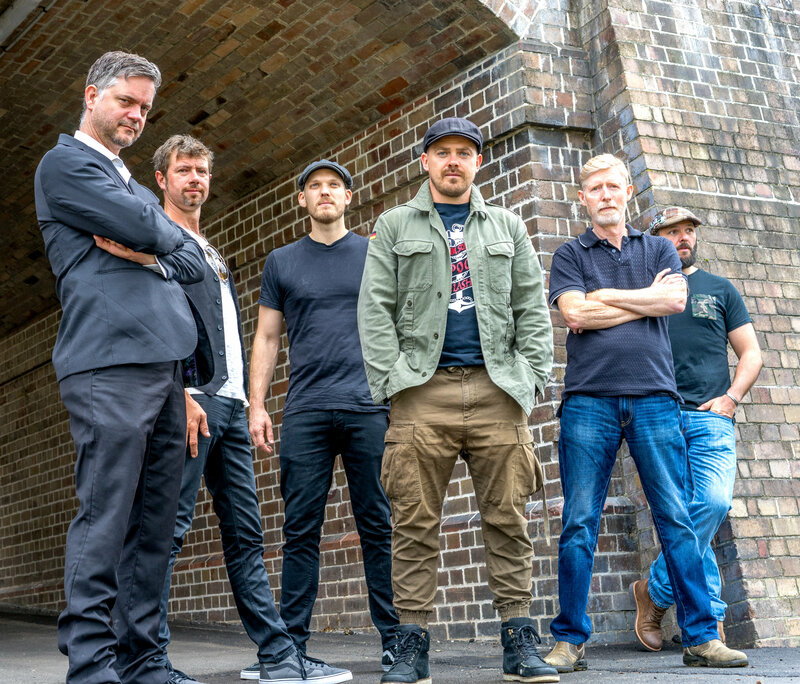 Rooted very much in a Celtic Rock style based on Australian and Old Ireland folklore, Medusa’s Wake has been described as a love child of The Pogues and Australia’s own Roaring Jack. Their debut album portrays lots of characters of time past who in fact where Rascals and Rogues hence with the naming of the album. The band spent quality time in Damien Gerrard Studio’s in Balmain with the brilliant Russell Pilling adding his magical touch to the recording. The debut single: ‘Seldom Sober’ was a late inclusion to the album. It is an ode to, lead vocalist Eddie Lawlor’s, love of whiskey. It is a hard and fast lively drinking tune to get you in the mood for a party! With band members John, Zane, Ben, Ron and Frank all fond of a drop of whiskey this song certainly shows the fun-loving high energy that this band is all about. 1. Your bio mentions your sound is a “lovechild of The Pogues and Australian’s own Roaring Jack” High praise indeed. It is a comparison and I think that’s where it stops! We have a similar edge but In my view, if we were to be half of what both those bands where we would be doing alright. I think the Irish/Celtic influence is there. I have gotten to know Steph Miller who used play in Roaring Jack and he truly is one of the most gifted musician’s and performer’s I have ever seen. Big boots to fill! We can only stay doing what we do and see how we go. 2. Favourite artists of all time? Did I mention The Pogues! Luke Kelly Folk singer with The Dubliners and Paul Kelly. 3. What current Australian acts inspire you and why? What international acts? I also play with The Handsome Young Strangers Driza, Looch, Adam, Dave and Na na are really top muso’s and have been doing it so well for such a long time. International acts always have been and will always be The Pogues! Medusa’s Wake launch ‘Rascals And Rogues’ at Norton’s Irish Pub in Leichardht (Sydney) 16 June. Following on from his ‘Run With The Wolves’ EP and tour Joel Leffler has released a stunning new EP “Strip Me Bare”, produced by long-time collaborator and ARIA winning Producer Peter Holz (Peking Duk, Gang of Youths). The first single “In My Sights” from the new EP is the song which features a guest vocal from Melissa Jane. Joel and Melissa shared a house together and have worked together on numerous recordings. This poppy anthemic tune hits home and you can’t help but sing and dance along to this great party song. Joel: ‘I had this melody stuck in my head for weeks. I would wake up, drive to work & go to sleep all with the chorus sitting on the tip of my tongue. I have never been so haunted by a melodic idea as much as I have on “In My Sights”. Joel will be performing live at The Brass Monkey and other Sydney venues for the new release of Strip Me Bare. Intrepid Blues & Roots man Daxton releases new album “In Verses” and scores Amrap Chart Spot. The new album from NSW Central Coast Blues and Roots Songwriter and Performer Daxton has instantly struck a chord with National Community Radio with first single Sanctuary sitting at number two on the Amrap/Airit Regional Chart for April 27 . In Verses starts off with a colourful up-tempo song track named ‘I Don’t Mind’ with high falsetto reminiscent of artist such as Marvin Gay or Eagles of Death Metal. As the album progresses further in you will notice some of the songs have a more psychedelic/grungy approach. There are nine tracks on the album, all highlighting Daxton’s multitude of influences ranging from psychedelic blues and alternative rock with a little Spanish guitar. As always with ‘Dax’, the sound of the south is a dominating force – a touch of delta blues working its’ way through the album. Daxton will be playing local shows followed by a tour to support the release- see website below for dates. “It’s not that much of a stretch to think that a fan of bands like Kings of Leon or artists such as Ray LaMontagne or even John Mayer could easily find something to like here..the crossover exists for sure.” Sleeping Bag USA Review. The Album is Out Now Via MGM. Sophie Kinston is Tailor Birds. Stilts On The Water Tailor Birds newest album is music that soothes the soul, warms the spirit, and ignites your passion. This is world folk at its’ finest, music at its’ most raw, Tailor Birds combines electronic violin, live looping, foley art, and rich harmonised vocals, to create a sound like no other. A sound that is all about the vibe and positive energy, building an audience that is as diverse as much as it is one, you could say that Sophie is a traveling troubadour. She believes that music should not just be about playing one gig after another with just the music making an impact, but is also o about connecting people to something good again, in a world that is constantly changing. Music needs to inspire and placing Tailor Birds in a space that can do just that, it makes an impact greater than you could ever imagine. THU – Jun 21, 2018 8pm – Holland, UK, Ireland, Italy, and further afield Europe tour 2018! !